That’s a working title, too, by the way. I still am not convinced it’s the final. Oh boy. Have I been having fun with this one. At first, I had a huge reluctance to work on it at all. I finally sat down and wrote about it and decided the reason I was fighting it was I didn’t know how I was going to manage the gold leaf part of the painting. Put it on first? Last? What was going to happen with the pastels? Would they all play nice together? The Kiss of Death, WIP. This is where I stopped and had to think about what I was doing. So I decided to experiment and get it all straight in my head before going any further. First, I took a piece of gator board and brushed some clear gesso on it to replicate the texture on my big board. 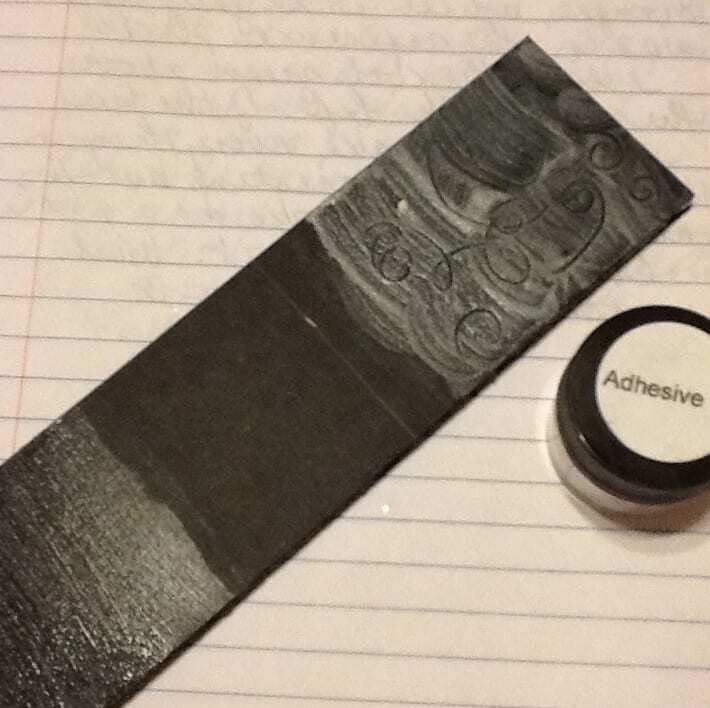 I decided to see if scribbling some lines into the gesso would hold up under the leafing. 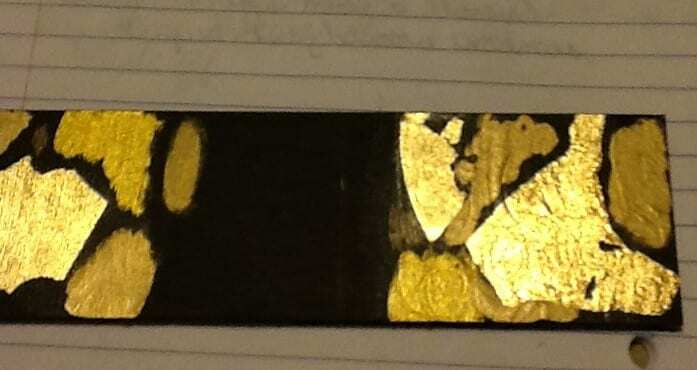 In the Klimt painting you can see where there is some relief going on under the gold. I wanted to see if I could get the same effect with gesso. After the gesso dried, I brushed on the adhesive from the gold leaf kit. 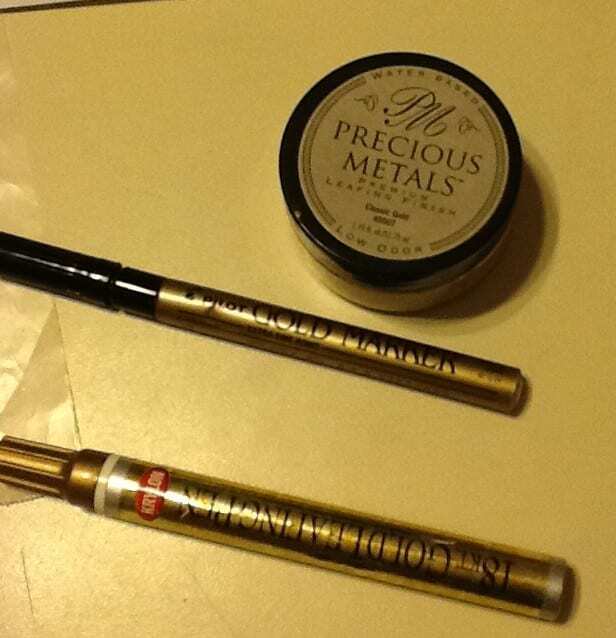 I also experimented with some other kinds of gold making. Here’s a couple of pens and a pot of leafing finish. Definitely, the gold leaf is the brightest of all four. And it seems to work well with the gesso relief, too. Yay! So, with this done, I was free to play once again. I brushed out some of the pastel that I had already done, reasoning that it would be easier to to the gold leaf first and put a texture on top of it, and then pastel than the other way around. You can see where I used the end of the paint brush to put in the swirls and circles. I let that dry, then brushed everything that was getting leafed with the adhesive. Here you can see the gold leaf plus the brushed on metallic paint all around the background. I may have to go over this with an acrylic wash to darken it some more. This stuff is BRIGHT! Don’t want to blind anyone! You can see some of the gesso texture coming through. Stay tuned, skelly lovers! This is starting to get good! This entry was posted in A pastel a day, Old (Dead) Masters, painting a day, Pastels and tagged gold leaf, klimt, old (dead) masters, pastel, The Kiss on November 24, 2015 by Marie Marfia.